The 2018 Kaslo Jazz Etc. Summer Music Festival Lineup has been a huge labour of love. 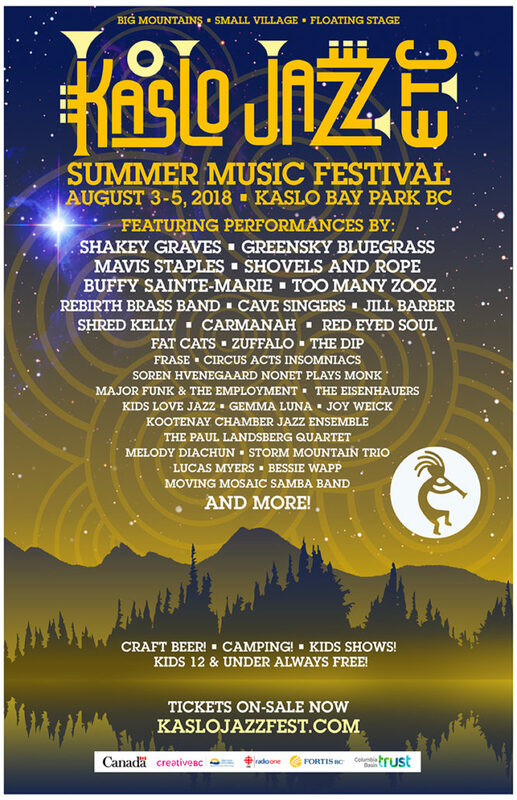 We are thrilled to release the final lineup to everyone and can’t wait to see you all dancing in the sand in Kaslo Bay Park this August 3rd – 5th! Want to know when Buffy Sainte-Marie, Greensky Bluegrass or Shred Kelly are playing? Looking for engaging workshops or children’s entertainment? There is something for everyone! Click the LINEUP icon to find out when your favourite act is performing! Single Day and physical Tickets are now available. For all ticket and outlet info please click on the TICKETS icon. With the final lineup announced don’t miss your chance to get your ticket! 2018 Vendor Applications Now Open! 2018 Camping Passes On-Sale!